Cold nights that are turning into brilliant blue sky days seem to be the norm right now. By the time we reach the warmest parts of the afternoon fish are still rising to Baetis and Midge activity. We can expect this to keep up until we get more inclement weather. In the meantime enjoy the extended fall season! Silver Creek is fishing well. The Browns are off of their Redds and are looking to put weight back on before the dark winter months. There are still some small Baetis hatches happening after the noon hour. This activity peaks by 2:00 p.m. and then tapers off slowly. Fish are also being caught with Streamers and it really doesn’t matter what time of the day you fish these. Fish bright colors on bright days and dark colors on cloudy days. The Big Wood just continues to impress as we enter into the early part of winter. Midge and Baetis hatches are still occurring when the wind is down. The Baetis hatches are matched well with a Gulper Special. The Midge hatch imitation is the Tie-Down Midge. Fish a Griffiths Gnat against the glare and then fish a dry-dropper with the Tie-Down Midge behind it. Keep your eye on the Gnat, as it will be easier to see. If anything rises within a foot of the fly, then set the hook! Most of the time you’ll find yourself tied to a fish at the other end. If the fish aren’t rising in the Wood, then try olive colored Buggers or Hares Ear Nymphs and Brassies fished under a strike indicator. 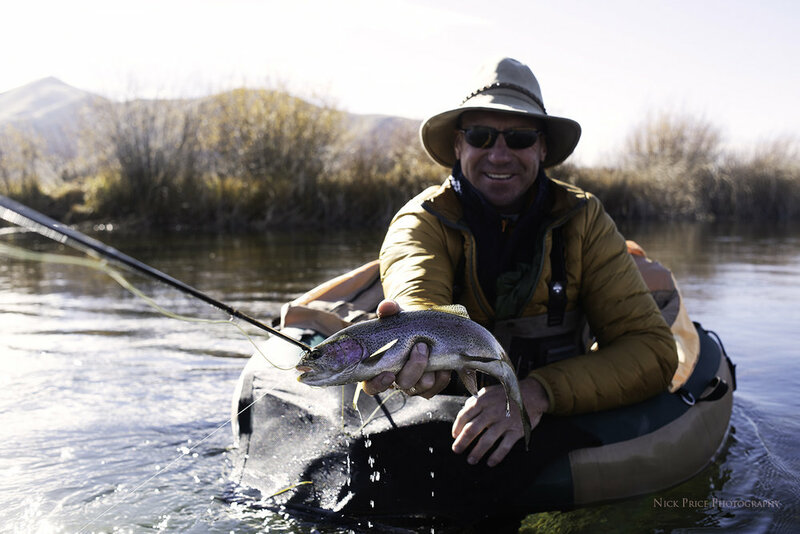 The lower Lost River is on par with the Big Wood these days, providing excellent fishing through the warmest hours of the day. Fish are still keyed on the color red from the washed down Kokanee dying as well as their eggs flowing though the water stratus up and down the river. The closer to the Dam you fish the more you will find this “red” effect. The South Fork of the Boise is still a great place to go “Cast and Blast” as the Chukar population is solid this year. The Baetis hatches are getting shorter with the days, but the South Fork is still an excellent place to go for slightly warmer temperatures. The Midge and Baetis dry fly activity is wind dependent, but is the wind is down, there should be some decent, if not difficult dry fly opportunities!